Over the last week, as the Tour De France has been reaching its drug-tainted climax, I have been reviewing online sites for the depth, quality and usability of their coverage. 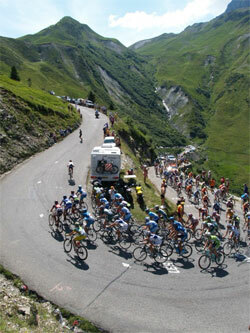 I've looked at the offical LeTour.fr site, the Yahoo! / Eurosport portal, The Guardian and The Telegraph, France 24 and BBC Sport. I've also looked at sites like CNN, The Independent and The Times where I expected to find in-depth coverage but didn't. Unlike today's finish on the Champs-Élysées, when we'll end up with a full classification of every rider who hasn't left the race in disgrace down to the second, I haven't scored each of the sites. I thought though, that it would be useful to gather together an overview of their features in my own Général Classement for this year's tour coverage. This hasn't been a comprehensive review of sites by any means. I ignored the red-top press in the UK, and neither the Mail or the Express seemed interested enough to warrant me investigating. I've also been pointed in the comments left on the series so far to The TDF Blog and the Lanterne Rouge Blog, which look like they would have been great to read during this year's tour - if only I'd found them sooner. Of the coverage I have been looking at, the stand-out contributions have been The Guardian's interactive guide to the tactics, Brendan Gallagher's blog on The Telegraph site, and the BBC Sport Cycling RSS feed. On race days when I haven't been able to get to a TV, but have had broadband access, then the stats dashboard approach of the official LeTour.fr site has been indispensible. Overall though, the virtual coverage maillot jaune has to go to the Eurosport / Yahoo! portal. They've made good use of their video content, really tried to get interaction going between the TV commentary team and the (albeit mostly grumpy) community on their messageboard, and made aspects of their TV coverage like the GPS available on the web. Sadly though, my final reflection has to be that at the moment I don't feel like next year I can be bothered in investing the hours of time it takes to follow the Tour De France. Given the choice today between watching the tainted finale of what is left of this year's Le Tour, or instead going out for the afternoon to do something else, I've opted for the something else. By Martin Belam on 29 July 2007. Hi Martin, many thanks for a great collection of articles on the Tour, and I must agree there are quite a few holes in the coverage on offer. Maybe there is room for someone else to sweep in, for example offering online audio coverage, but here's to next year and hopefully a clean race. Martin, the climax of the Tour is always an anti-climax, drug tainted or not, because the race is won and lost on the mountain stages. You will be back for those. One thing you didnt cover, and sorry I have come to this late, as i havent had a look at your blog for ages, is the T-mobile site http://www.t-mobile-team.com/en during the race this had live telemetry from several riders, so you could see their GPS position, heart-rate, speed, power output, cadence, etc. Very geeky (but cycling is the ultimate geek sport) but fascinating as you could see how strong and fast these guys are, but also take solace in the fact that even they can only go up the steep Cols at 15/16 kmh.